An aerial photo, not initial lay-out for a golf course, when now one will find the Bird Sanctuary. Early in the planning the golf course was moved to its present location. Beautiful and historic Dauphin Island is located four miles out in the Gulf of Mexico of the mouth of Mobile Bay. Dauphin Island has a romantic and colorful history that dates back to the early days of colonial America. Settled by a French military expedition in 1699, it has since been under the Spanish, English, Confederate, and United States flags. A semi-tropical leisurely paradise, with all the modern conveniences, luxurious motels, apartments, and clubs, its unsurpassed snow-white beaches are caressed by the blue waters of the Gulf of Mexico and Mississippi Sound. 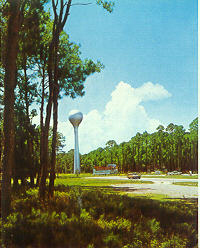 The new Dauphin Island Water Tower at the south end of LeMoyne Dr. The Holiday Inn, on the beach. Located where today cars park for the Public Beach near the Little Red School House. Golf at the Isle Dauphine Golf Club. Post Card looking to the Club from the beach. Shell Collecting is a pleasant way to spend the day.